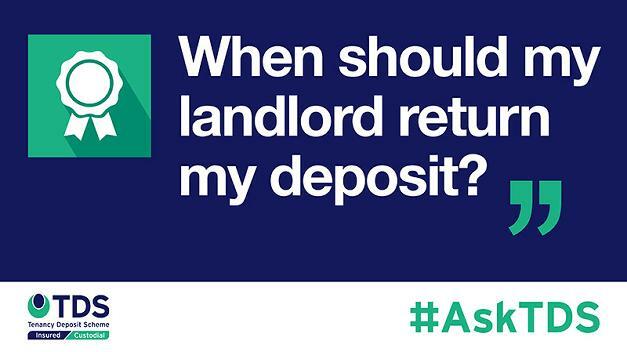 #AskTDS: "When should my landlord return my deposit?" When a tenant leaves a property, it could be for a number of reasons. Perhaps they’ve moved location for work, or up-sized to start a family or possibly the case that they’ve taken a first step on the property ladder, leaving the private rented sector behind. Whatever the reason, they will all have at least one thing in common: wanting their deposit back as quickly as possible. Firstly, you’ll need to know whether your deposit is protected with our Insured or Custodial scheme. The Prescribed Information and Scheme Leaflet you should have received at the outset of your tenancy should contain this information. If you aren’t sure, or don’t have these documents, you can use our online deposit checking tool. If the deposit is protected by TDS’s Insured scheme, the tenancy deposit in this instance will be held by the TDS Member: either the letting agent or landlord. You should check the documentation and the tenancy agreement to see who is the holder of the tenancy deposit. Once the tenancy has lawfully ended, a tenant should ask the party holding the tenancy deposit for its return. Within 10 days of the tenant asking for their deposit, any items that may attract a possible deduction should be identified, and the tenant notified. Any amounts that are not in dispute for a deduction should be returned to the tenants as soon as is reasonable. Alternatively, if your deposit is protected by our Custodial scheme, the tenants can request repayment at any time after the end of their tenancy. This is done online, and the tenants will need to have activated their account with TDS Custodial to gain access to their account. If a landlord or a letting agent acting on their behalf does want to make a deduction from the tenancy deposit, they should communicate this to you, outlining why and for what amount. Although these are sometimes obvious (i.e. a carpet stain), what can be less clear is whether or not the reason given can result in deductions. This will depend on the tenancy agreement. If following discussions and negotiations with your landlord, there is still no agreement, you may want to seek a way to resolve any impasse. TDS does offer a free and impartial Alternative Dispute Resolution (ADR) service which is free to use. You can find out more about how deposit disputes work here. Although the ADR service will be provided free by TDS, every effort should first be made between tenant and landlord to come to an agreement. Often, clear communication between parties can lead to a quick resolution without the need to open a dispute. Please note that TDS Adjudicators are only able to provide dispute resolution for matters concerning the deposit; counter-claims cannot be considered. When leaving a property, it’s in the interests of both parties for every issue to be dealt with as quickly and efficiently as possible so both can move forward. In order to do this, both must know their rights and obligations around deposit return timings and where to go if a disagreement does emerge.